EVGA class supplier was apparently still need time to introduce the LGA 1155 motherboards are compatible to the market. As I do not want to repeat the same mistakes associated with the presence of Intel's Sandy Bridge-E, secretly EVGA reportedly also has begun to develop and prepare the product fleet X79 dual-socket motherboard that will replace the motherboard Classified SR-2 was incredible. Although EVGA does not include the ranks of the LGA 2011 motherboard products besutannya at Computex 2011 exhibition ago, but returned the EVGA motherboard is reportedly preparing new Intel X79 chipset-related presence in this fall. And a few months ago after the release of this first model, reportedly will then be followed by the presence motherboard dual-socket LGA 2011. Most motherboards Classified as SR-2 that there are currently more targeted primarily for its loyal users and overclockers. But unfortunately, no specific details available for now. 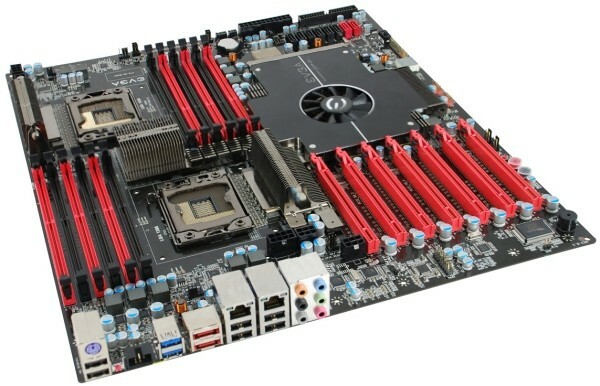 Motherboard Classified SR-2 has been designed to operate two LGA-1366 processor and was released in March 2010 that then. Coincide at the Computex 2011 exhibition ago, most motherboard manufacturers have demonstrated the ranks of the LGA 2011 motherboard products. However, of all that was exhibited, it seems that no one was really designed to support two Intel Sandy Bridge-E.
X79 dual-socket motherboard that there is currently only Danushi Bay Asus model, but this model was designed only as an easy upgrade path from LGA LGA 1366 to 2011. So far, Intel is expected to launch a batch processor in Intel's Sandy Bridge-E high-performance first in the fourth quarter of this year as well, along with the presence of X79 PCH. At first, the customer will be served by the presence of only three chips, including two six-core and one quad-core models. Both six-core SKU will be present with a completely open design, but Intel's flagship processor would dibesut with 3.3GHz clock and packing 15MB of Level 3 cache. Meanwhile, the relatives of the smaller will dibesut clock of 3.2GHz and packing only 12MB of L3 cache only. Meanwhile, according to TechReport publication of a recent, three-core processor package will resemble the last four computing cores (about 8 threads). And it reportedly has restricted its overclocking capabilities so that will be able to display 10MB Level 3 cache and 3.6GHz for its base clock.